Guess that we should have one thread as not to frequently 'hijack' Leak Tube Amp thread at Equipment Discussion. I am glad to know more and more audiophiles in Seremban. Although quite different from the group in KL that I knew of but it is all about passion for music listening. The enjoyment of it, so to speak. It has been enjoyable for the many gatherings that we had. Since I already have SS amps, I will go into tube amp territory in near future (tks to cyh, rsbn and the gang). Considering Melody (SP models) or Ming Da (maybe MC3008-AB-SE) for a start. htkaki wrote: Guess that we should have one thread as not to frequently 'hijack' Leak Tube Amp thread at Equipment Discussion. The turnout on last Friday was larger than expected though some of them came with the intention of getting a glimpse of the latest Triangle speakers in town. Unfortunately, it was not the right time yet. All thanks to Mr.W for taking all the troubles to bring the heavy amp over to fire up the Quartet. Can't wait for the next round. Please let me know when is the next gathering. I have been following this thread with great interests. If time permit, can I join too? HI...if time permits .... can "Segamat"-ian join in too ??? (pop in on my way KL - Segamat). OK. Will keep you guys updated on the next gathering. Need to plan the stuffs to be included into the 'menu' for next round. Oh ya.. I have forgotten to thank rsbn and cyh for bringing their powercords. Thanks a lot, guys!! All are welcome It is good to share things and experience. this thread with great interests. If time permit, can I join too? The gathering that we had last week had 8 gentlemen in it. Luckily, the room is big enough to fit all. chamts1 wrote: HI...if time permits .... can "Segamat"-ian join in too ??? (pop in on my way KL - Segamat). Cross border audiophile You can join too. The only problem for you is that the gathering is normally after dinner. Max, is it at your place? Don't mind dropping by too if coincide with my monthly/fortnightly balik kampung trip ..
At one time was in touch with another guy in Rantau with Krells and Clearaudio TT (not sure what r his speakers). Meant to drop by but now lost his number oledi..
zeebee wrote: Max, is it at your place? Don't mind dropping by too if coincide with my monthly/fortnightly balik kampung trip ..
At times, we do change venue but mostly at my place since can blast it out w/o worrying neighbours. Less interruption as well as quiet enough for our listening session. I did heard abt the Rantau guy. There is 1 in Mambau too with SF Guarneri. I did invite him to come over. Very low profile uncle. I did invite SJ and 'lazy' WongKN (to bait him here) to come over but they are too busy. Seems like a *hot spot* for stereophiles gathering. BTW, care to share the shootout result between SF, LS3/5A & Triangle? A local dealer here is thinking of bringing in LS3/5A. Rantau fellow? 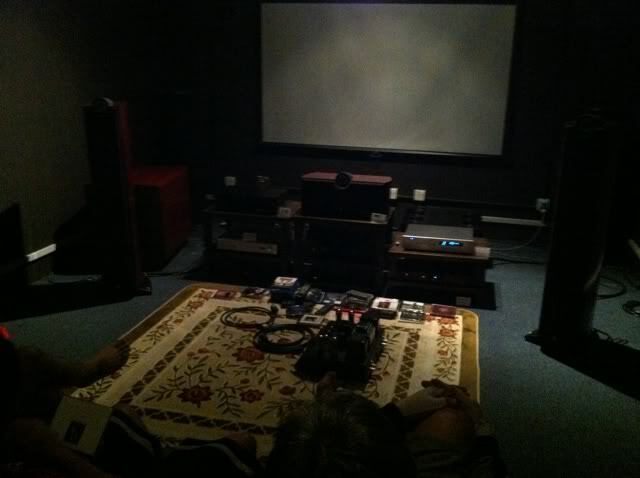 I'm from Rantau as well but dunno anyone crazy wt Hifi plus he is using high end stuff. Mind to know his name or look? I find him out..
Mikapoh wrote: Seems like a *hot spot* for stereophiles gathering. Nothing compares to the other PJ group. If you have the time, sure you can join us. The LS3/5A indeed is nice speaker renowned for its vocal reproduction. But, it needs a well matching tube amp to bring the best out of it. The shootout that we did is sort of not doing justice to LS3/5A as we are using ss pre/power. Fret not, we shall soon have a resident tube amp in near future. There are many in Seremban and adjacent area. Just that they are very low profile and humble. Mostly above 50y.o. and probably not so tech savvy. When you mingle with the group, then you will know who's who and what systems that they have. I was told that Dr Rashid was supposed to be in Seremban on last Sunday. I am not sure whether he did come down or not. rsbn589, I think cyh could not attend this week. Aiseh... We have to call Tubey Wong lah. Sure he will be excited. Aiseh.. Too bad the Air Tight is no longer around. Wow.. Looks like it's going to be another happening Friday night this week. Car, thank you very much and please do keep me posted on your next gathering. BTW, where is the venue? In Seremban? I am not very familiar with Seremban, can you PM me address so that I can GoogleMap it before hand? I must congratulate the team for such energetic event, you guys made me feel old. Hi Max, I have not visited rsbn589 for quite a while! It is long overdue and I am looking forward to it. He has some very very fine collections that not all with money can buy! On the shootout between SF, LS3/5A and Triangle, I hope you did not bullied my love ? Well, it is a 40-odd years' speaker technology. Jo Ki, do not worry your love. In fact, he told that LS3/5A serves as an eye-opener for him. The babes must have impressed him so much. Wow, 40yrs has passed. This proves that age has nothing to do with loudspeakers sharing BBC designed heritage. hi mkp, what if kl-an visits kch? any chance to allow my audition? over to fire up the Quartet. Can't wait for the next round. Jo sifu- if you can come, would like to humbly request you for something....your autograph? ...wah! Max! I not that old lah! Next time I will not bring my Led Zep, CS&N, Whitesnake cds anymore....more Lady Gaga & Taylor Swift in future! And also will re read my 'The Complete Guide to High End Audio'! BTW Max, by posting pics like this, make me wish I can postpone the BEAST concert! jokiarch wrote: Hi Max, I have not visited rsbn589 for quite a while! It is long overdue and I am looking forward to it. He has some very very fine collections that not all with money can buy! Unc Jo, rsbn589 indeed has exclusively fine collection like the 'radiator grill' spkrs and the many more exotics. We did not bully your love but it did bully my power amp. It is a wrong match so to speak. I guess it is due to its nominal impedance. With a 200watter ss amp, it does no justice to your love. However, it is fab with a tube amp as we all know. The Triangle was an all rounder in the shootout. It just keeps playing nicely with whatever stuffs that we threw at it. Even with different amps, it did not disappoint. Perhaps we can arrange a special pre-KLIAV gathering on a weekend afternoon? I bet you'll visit rsbn589 after that. Darn! Max can change name ar? S A G dont sound so good leh! Maybe NSAF, NS Audiophile Front? After all not all of us are from the town. OK. Already sent a PM to you with all the info. Thanks. At the same time, we're not only comparing equipments but sharing music among the members as well. After a few rounds, I got to know a lot more beautiful songs and great albums. Don't worry.. We will make you feel young again!! Wah.. Looks like there are some more new toys lining up the menu!! amps, it did not disappoint. I have to agree. The Triangle Genese Trio was very good. Sounds transparent, reveling, very lively & fast sounding book shelf. Again I have to say with the Air Tight, it sounded the best. Add a good pre amp, like a Fisher, you can listen to this pair for hours. You can come on weekend after the concert. NSAF? Man, that sounds like some sort of States Air Force. SAG is not good though esp for us, the ageing group. I intend to invite 'Uncle Kopi' of Mambau. I talked to him once when I bumped into him about 2 months ago. I always wonder how will the Trio sound with a more powerful Air Tight. Hopefully, there will be a chance to audition one in the near future. By the way, this week's menu should be a very good experience. I have waited for a long time and special thanks to the kind owner for giving us an opportunity to broaden our listening experience. Age is no barrier. Proven. 20+ year old can still join you all ma..
Too bad that my wallet is very tight for Air Tight. Anyone volunteer to bring an tube int amp? Eh! 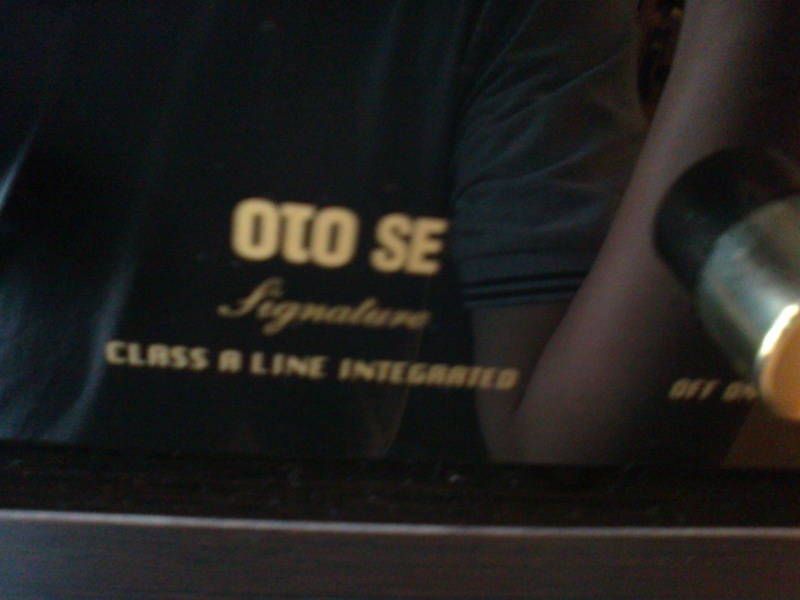 I thought AN Oto Se is coming?! cyh wrote: Eh! 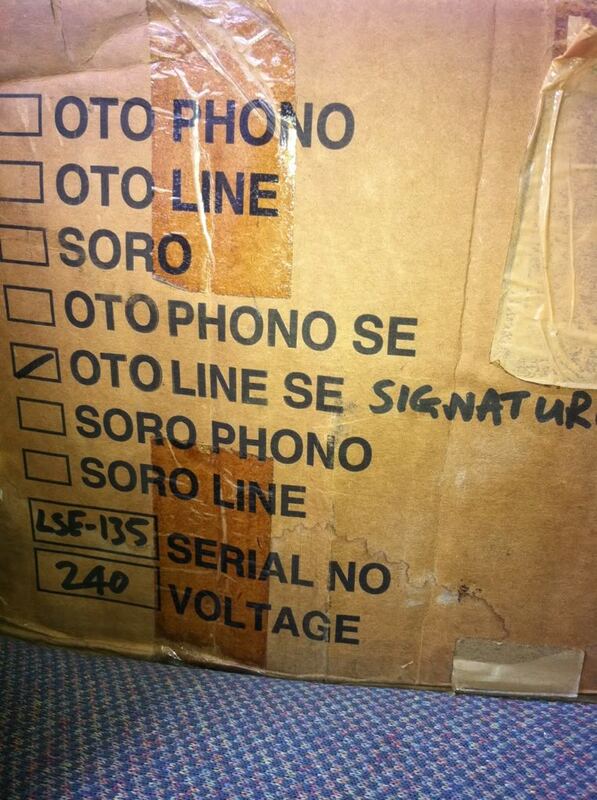 I thought AN Oto Se is coming?! Aiyak ! Now only saw this. I got new nickname already ! That means the bait ain't effective. On a serious note, I really intend to invite you guys from PJ camp to come over on a nice weekend. SJ ain't free this weekend. Meantime, I am running in my newly arrived loudspeakers that are meant for KLIAV. Don't get me wrong, I am very honoured to receive your invitations. And so many times some more. In the near future ! Meanwhile my KLAVS promise to you is there. So, do you still want to go to the BEAST concert? Ai yah! Family duty calls! Oto can wait for me on Sat! More importantly, how well is the new french running? WongKN, don't worry. There will be a chance. Perhaps, by that time, someone already managed to get the matching PAIR of pants oledi. French gals are still undergoing some warm-up sessions oh..
We might have a Signature Canadian lady on Sat to pit against the French. Probably, we have to organize a special league on Sunday. My guess- New french lady, with Oto. Chinese cannot make it. A Canadian gatecrasher. Will American or leaking British make an appearance? For sure 2 chicken man & Muddy Waters (lai sui loh) will come? I suspect Dom Perignon & foie gras will be served. And too bad korea singing on friday! Eh Max! Wonder who wrote the word 'signature' ? Dropped by to check on the menu for Friday party. It's in pristine condition. Beautiful!! cyh wrote: Eh Max! Wonder who wrote the word 'signature' ? Probably AN did not want to produce new box for this special limited edition. I collected it from Mr Oh as the generous owner has not been using it for about 10 years. Mr Oh did the service and check. He likes this very much. Owner is keeping it for sentimental value. I did a brief 1hour plus listening with Trio. You should come. I did a brief 1hour plus listening with Trio. When you returning the Oto? It is here for a week or so. Fuh yoh.. very nice reflection!! Stage is set. CDP. Check. Speakers. Check. Cables. Check. Don't worry coz there will be another round this Sunday afternoon with some Canadians as guest stars. 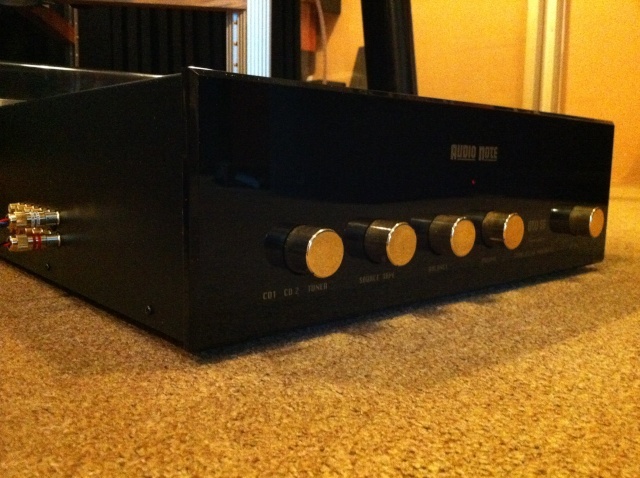 Also a Rotel Class D 500W power amp too.